Specialist and professional Corporate Entertainment on board our custom built RIBs, Powerboats and various other Yachts. You can rely upon us to provide the best day for you or your clients. 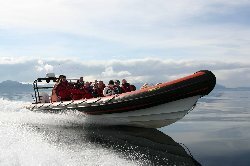 We provide the best and most unique Corporate Events in Scotland. We have a proven track record with premier clients. All sizes of busineses and groups can be catered for. We also run Corporate Sailing events and Powerboat days. 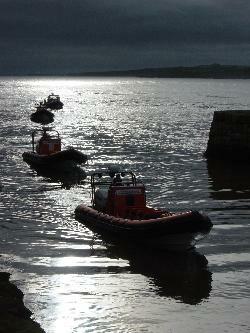 Cumbrae Voyages are the only RIB operator licenced to operate in the upper reaches of the Clyde by Clydeport. We run events from Largs, Glasgow, various ports on the Firth of Clyde and also please note that we are fully mobile and can bring our boats to your location. Please just get in touch with us with your ideas and we can deliver. If you are looking for ideas then hopefully the pages here can help with this. We run mixed corporate days that can include heilcopters, golf, clay shooting, quad biking and of course fine dining at some of the best restaurants that you will find anywhere. 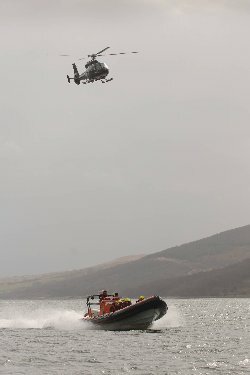 When we quote for a day we normally include everything you require for your Corporate Event from all the boats, fuel, skippers, all safety equipment, meals, road transfers and if you request it, helicopters for the event. Please take a look at the different options in the Corporate Menu above for Largs, Glasgow and Custom locations as they have some example itineraries. An interesting option is to combine RIBs, luxury powerboats, sailing and helicopters to your Corporate Day. Of course this adds to the cost but it makes for the ultimate day for your clients. We run a Team Building Days and Treasure Hunt Days. If you wish to challenge your staff or reward them then this can be arranged.